Yes, small house plans could be the answer. Kit home sites have ingenious small homes ready for you to build within weeks. These small home plans, ‘cottage’ plans or ‘bungalow’ plans have one thing in common, they are a piece of cake to plan and build. I also have a cabin plans page, a yurt page and a minimalist home page. Architects and draftsmen have masterminded unique cottage floor plans that combine compact size with all the features of a regular home. Cottage kits are extremely popular for small house lots, or where space on your block is at a premium. Popular uses include bed and breakfast businesses, holiday homes and downsizing on retirement. They are also cheap as chips and start at around $30,000AUD for a single bedroom kit, with all inclusions. That makes small kit homes one of the least expensive means of constructing small homes. A small house is not merely as good as a larger house ; it is better. A home that is designed to meet its occupants’ domestic needs without exceeding those needs will surpass the quality of a bigger one in terms of sustainability, economics and aesthetics. Modern houses have, quite literally, become bloated warehouses full of toys, furniture and decorations, and a lot of things we may never see or use. Entire rooms must be added to accommodate anticipated parties that may never be given and guests who may never arrive. It is not uncommon for a living room to go unused for months between social gatherings and, even then, quickly empty out as guests gravitate toward the informality of the kitchen. Most small kits are ‘open plan’ which allows for the space of the home to appear much larger than the square footage would allow. Each room blends into the next creating a series of multi-functional areas as opposed to the more traditional living room, dining room and family room defined by the more closed nature of more traditional homes. Cottage kits take full advantage of this concept utilizing innovative small home floor plans to create and enhance compact lifestyles in an economical building kit. Go to my Granny Flat resource page here or to my Granny Flat plan reviews here. 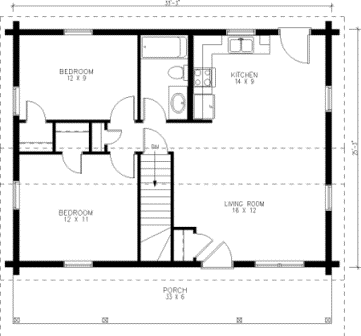 You can do some extensive research on a plan site such as Australian Kit Homes Plans, who provide small house plans, engineering layouts, and working drawings of small house plans, as well as every other type of plan you could think of. Here are some examples below. Click on the graphic to go to the site to start exploring. Look for Kit Homes on the left navigation menu and have some fun. Share your experience about finding the perfect small house plan. Do you have a favorite plan? Great! Click the button and find it on your computer. Then select it.